I haven’t post here from a lonnnng time… And i restart to explain a quick trick. 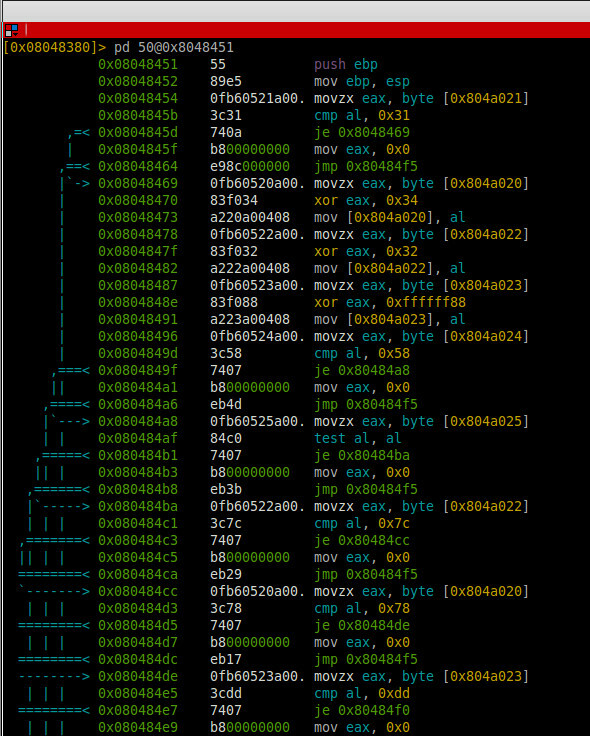 The output is quite dirty, there is some bytes (probably headers) to remove until the MZ. If you want to remote debug an android binary in a VM, you can use IDA easily, but if, like me, you run IDA in an virtual machine, you need a trick. 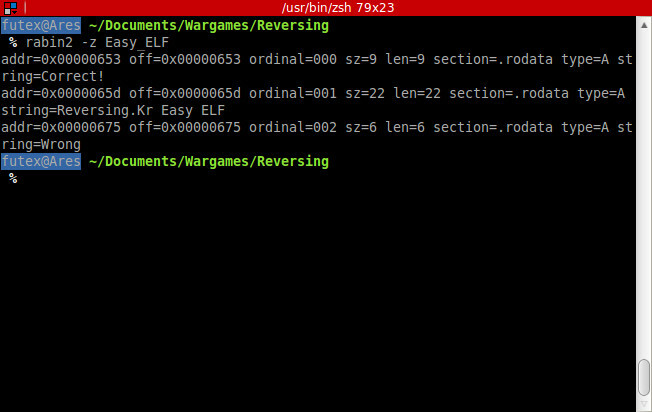 Forward the debug port (23946), for use it on your local machine, now android_server port is just bind on your lo interface, it’s not accessible from an other interface, and you can’t use iptable to forward it. But redir can! 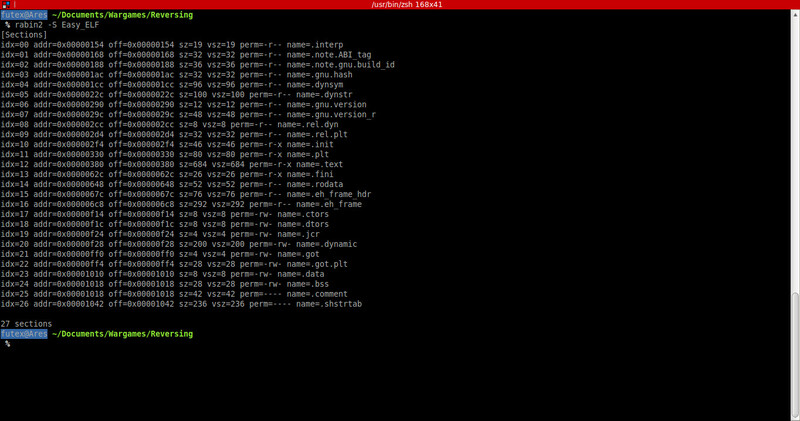 Don’t forget to add just the remote paths, if IDA can’t find the binary in the android VM, he will upload it. I recently heard ofa new system logger, . It’s seem to bee very completly, it use strace, tcpdump,lsof for take trace. I want to try it on a honeypot. 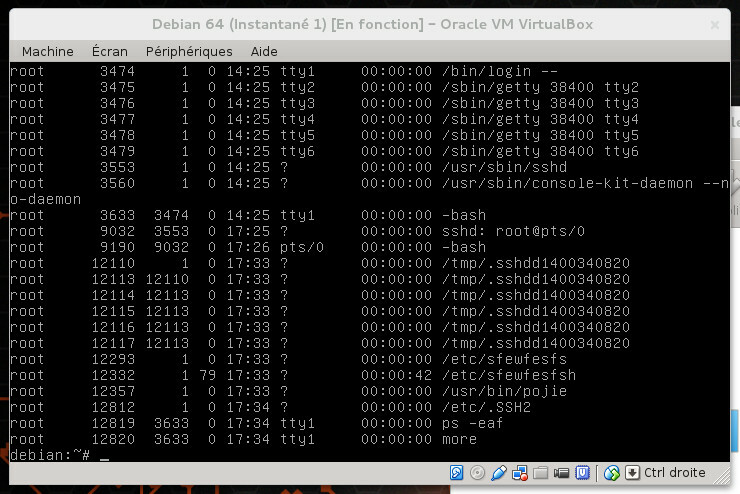 After, 4 hour, my VM was pwn. And root file is intended to be used as a cronfile. 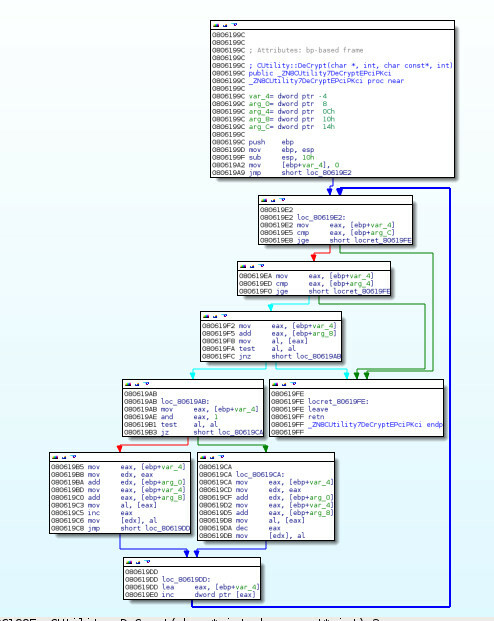 Al binarys as know to be ddos tools and Elknot Trojan, if later i have a little more time, i try to reverse it. Jvoisin and Maijin, a members of my hackerspace (Hackgyver) always talk to me about Radare, a new reverse engineering open source framework which they are working on. So i want to try it on a very simple Linux crackme. 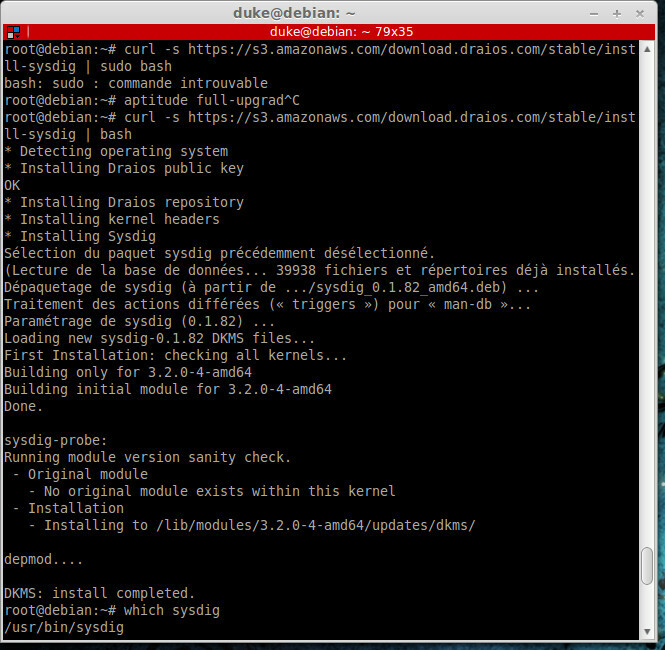 Classic and easy install, download it to the git, configure, make and make install. I want to see it’s strings. We arrive to the start function and we can see the main function start at 0x804851b. The first cmp compare the second letter of the pass with 0x31, an the fifth with 0x58. All other characters is just xored. 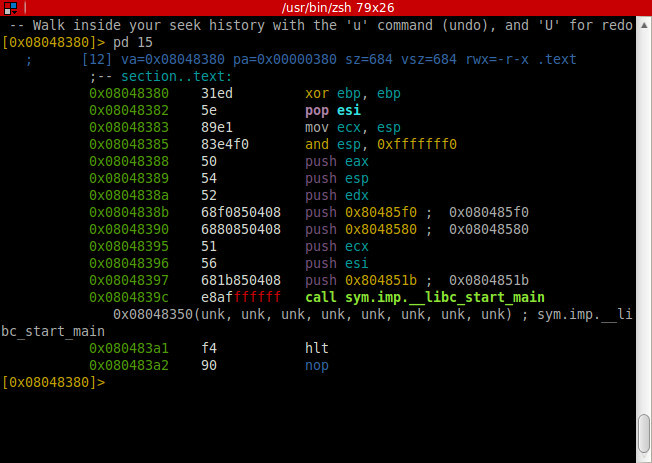 Radare support many architectures arm,x86, x86-64, gameboy, mips, sparc,… and many type of files, dex, bios, elf, PE, COFF. Radare team make a great work! 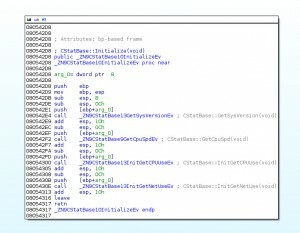 Depuis le kernel 3.2 un nouveau paramètre pour le système de fichier /proc a été introduit, “hidepid”, permettant d’afficher à l’utilisateur seulement ces propres process. Pour l’activer, il suffit de modifier la ligne qui va bien dans /etc/fstab. 1 L’utilisateur ne voit pas les autres process via ps, top etc .. mais peut toujours les lister dans /proc. 2 L’utilisateur ne voit pas les autres process via ps, top etc .. et ne peut pas les lister dans /proc. A few days ago, i receive a weird connection on my kippo honeypot. An guy as connected on, download a binary file and try to lauch it, but, not succesfully. 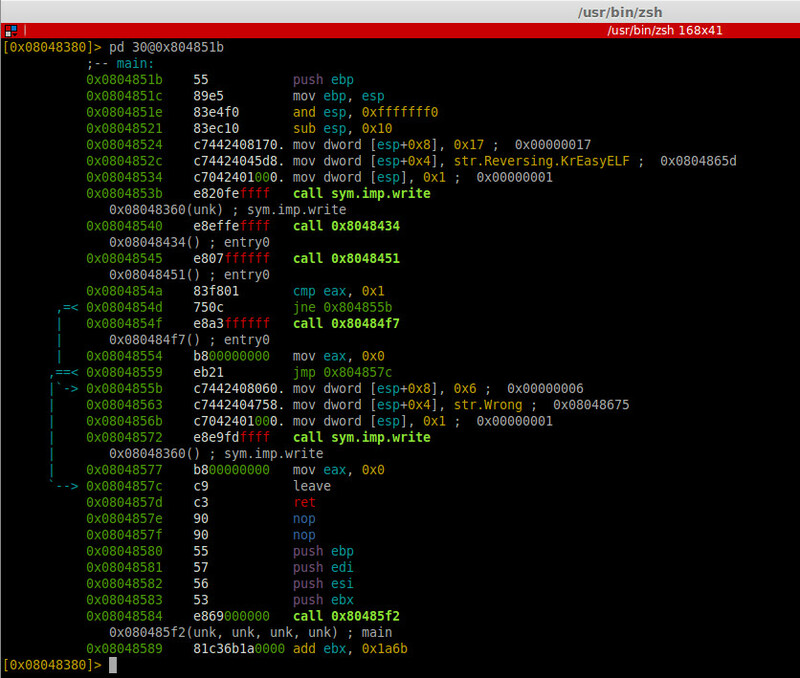 So after some checks, i can download this binary :), so, go to analysis it! 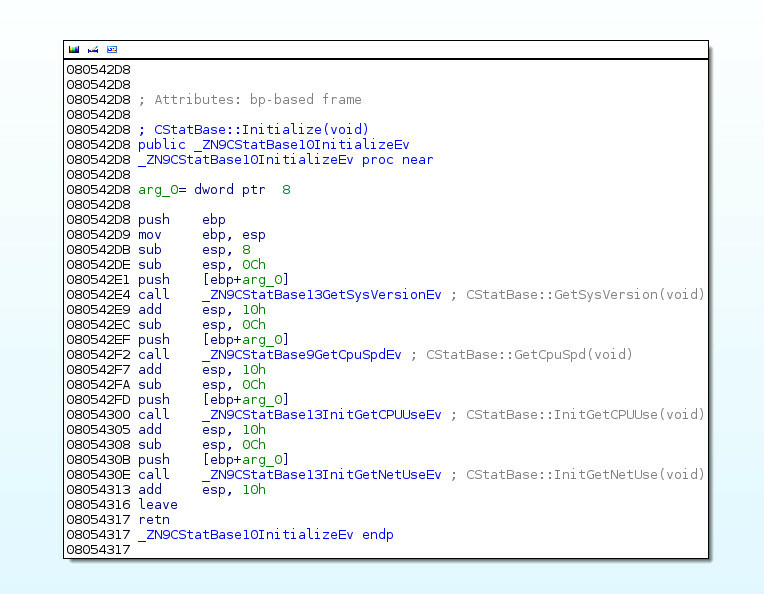 Look at the main function in IDA. Coded in C++, it run as a daemon, after, it lauch _ZN9CStatBase10InitializeEv who get some system infos. 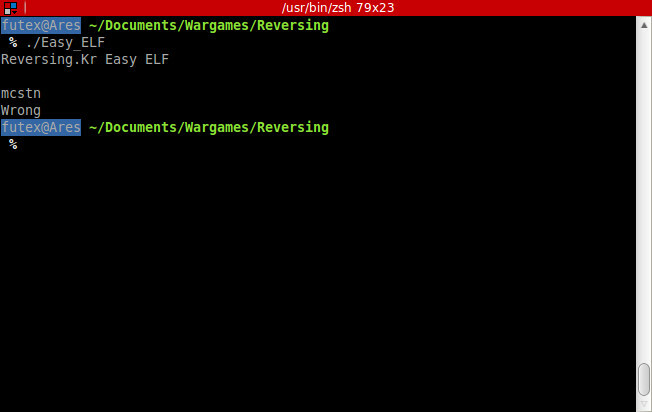 _ZN9CStatBase13GetSysVersionEv do a uname command. _ZN9CStatBase9GetCpuSpdEv get cpu info to /proc/cpuinfo and extract frequency. __ZN9CStatBase13InitGetCPUUseEv open /proc/stat file and check cpu usage. _ZN9CStatBase13InitGetNetUseEv open /proc/net/dev and get network informations. 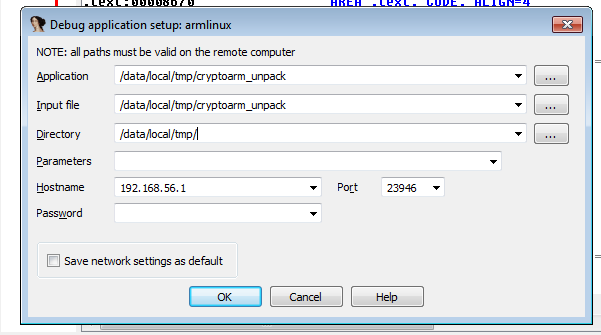 Decrypt fonction as call twice, one with the argument 281-206-3//18 (the C&C ip adress? ), decrypt value is 190.115.20.27, and after with 68961 as the port number 59870. Not necesseray to make a script to reverse this fonction, we can see decrypt values in memory, but this function is easy to understand, it make one ascii addition of the crypted value, after ascii soustraction and loops. After, it call _ZN8CManager15StartNetProcessEv fonction, who create a thread, initialize a socket, and send information. 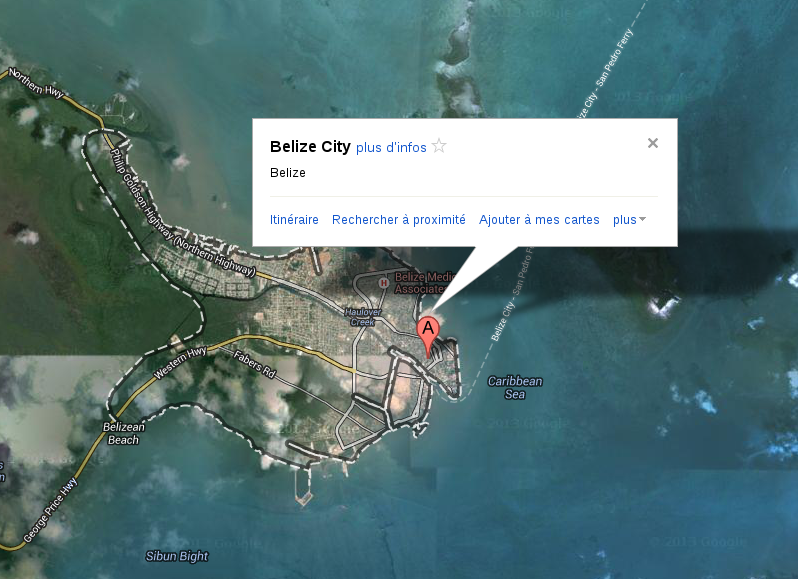 And it create an fake.cfg file, it’s containt the ip adress of my hosts, corresponding for me to the local adress. After it read /proc/stat and /proc/net/dev file and just send kernel version to the c&c in loop. In July 2013 we saw a new vulnerabilite on AIX, it’s possible to allow local users to gain privileges with a very simple way. 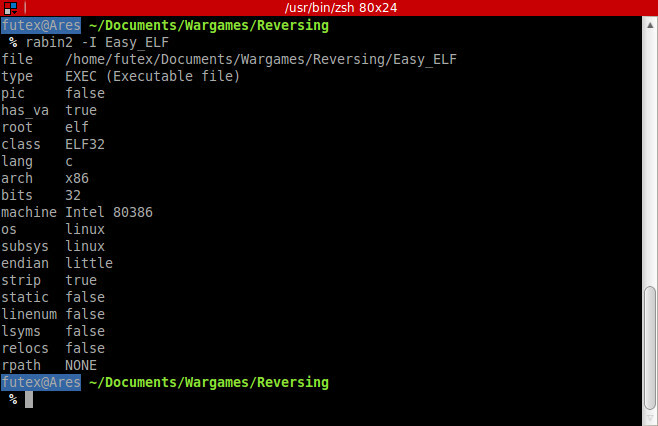 After hunts, the real binary is /usr/sbin/ibstat, and is setuid bit! As we can see, all command are not call with her full path! So, we can exploit it easilly. Check device state of “icm” and “en0”. Son but est de partager les bidouilles, expériences et compétences que j’ai dans l’informatique en générale, la sécurité puis un peu tout et n’importe quoi.